Comments Off on Critical Moments: How should Catholics pray before and after Mass? It happens every Sunday. Parishioners scurry into their pews moments before Mass begins. A few sneak in during the opening song or even the first reading, hoping that no one will notice. After Communion, the church is noticeably emptier than it was only minutes before. Several members of the congregation have slipped out the door to hurry off to their next activity. Many others bolt to their cars after the final blessing or file into the parish hall for coffee, donuts and friendly conversation. Catholics who neglect to arrive early at Mass and hesitate to stay late are missing out on critical moments they could be using to cultivate their spiritual lives and grow in their relationship with God. 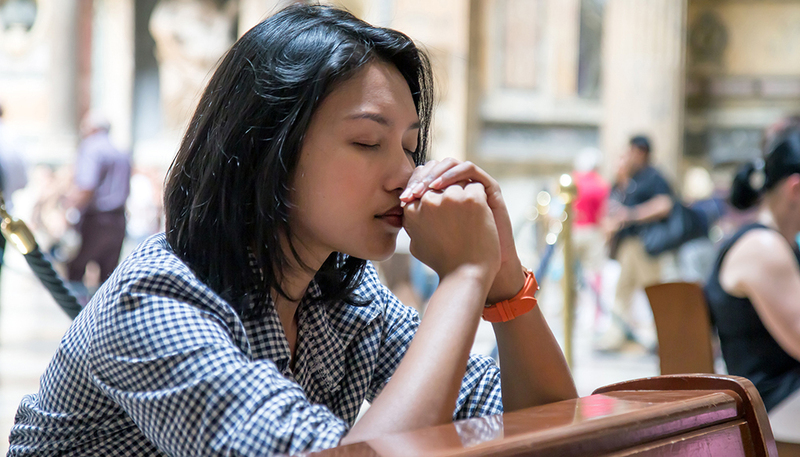 Taking a few minutes for silent prayer before and after Mass can help Massgoers focus their attention, prepare their hearts for worship, express their gratitude and carry their experience of God back into their daily lives. Human minds wander. At one moment, a person is devoutly focused on singing the praises of God in the Gloria. In the next, she is thinking about what she would like to have for lunch. These lapses in attention happen to everyone from time to time, but they can be minimized by designating a few minutes before Mass to quiet the mind and zero in on God. Begin by simply greeting God and reciting a few familiar prayers — perhaps the Our Father, Hail Mary and Glory Be — to direct the mind toward the divine. Set before the Lord anything that is troubling or burdensome, and surrender it to His all-powerful care. Examine your conscience and repent of any sins that might be weighing heavily upon it. Lift up family, friends and acquaintances to the Lord and place them in His loving protection. Let go of anything that might distract the mind from offering God full praise, devout prayer and reverent worship over the next 60 minutes. Now that the mind is focused on God, it is time to prepare the heart to worship Him. Focus especially on what is about to happen in the Mass. Recall that the lector and deacon or priest will be reading from the inspired and inerrant Word of God. Remember that Jesus is going to be really present — body, blood, soul and divinity — in the Eucharist. Recollect that this Eucharistic Jesus will come in a highly intimate way to each and every person who receives Him in holy Communion during the next hour. Most importantly, ask God for help. Ask Him for the attention and devotion necessary to pray and worship well during Mass. Ask Him for the grace to receive Him worthily in holy Communion. He will always respond graciously and powerfully to an open, longing, loving heart. When Father says, “Go forth, the Mass is ended,” do not take that as a cue to dash out the church door as quickly as possible. Instead, when the closing hymn ends, remain in the pew for a few minutes to bask in the intimate presence of the Eucharistic Jesus and to thank God for the great gifts He has just provided in the Mass. Express heartfelt gratitude for the opportunity to worship with the saints and angels; to hear God’s Word solemnly proclaimed; to witness the sacred moment of consecration when Jesus became truly present on the altar under the appearance of bread and wine; and to receive the Lord of heaven and earth in holy Communion. Do not rush through these moments of thanksgiving. God has given His very Self to His people in this Mass; the least His people can do in return is give Him thanks. 1. Get up 15 minutes earlier on Sunday mornings or start getting ready for Mass 15 minutes earlier on Saturday evenings. Then, be ready to leave for Mass 15 minutes earlier than normal. 2. To avoid feeling rushed, do not schedule any activities until at least a half-hour after Mass. 3. Make a firm commitment. Spiritual growth requires discipline, but God rewards His people’s efforts thirtyfold, sixtyfold and even a hundredfold (see Mt 13:8). 4. Invite others to pray. Sharing a prayer commitment with family, friends and fellow parishioners provides necessary motivation and support. 5. Do not fret about distractions during prayer before and after Mass. Gently guide the mind back to prayer whenever it wanders. Pope Paul VI once called the Mass “the most perfect form of prayer.” Indeed, during holy Mass, God deepens and broadens His intimacy with His people as He speaks His Word to their hearts and nourishes their souls with the Eucharist. Is it not fitting, then, that Catholics should prepare carefully and thoroughly for this tremendous encounter with God? And is it not fitting that Catholics should express their gratitude for such an encounter? By spending time with God in prayer during those critical moments before and after Mass, Catholics will better appreciate the great gift of this most perfect prayer and, more importantly, grow ever closer to the Giver. Amy Troolin is a freelance writer from Minnesota. She holds a master’s degree in theology and Christian ministry from Franciscan University of Steubenville.